Scientific name: Order Lepidoptera, family Lasiocampidae, Malacasoma spp. Forest Tent Caterpillar (no tent) - Malacasoma disstria. Tent Caterpillar - Malacasoma americanum. Identification: Adults are heavy-bodied, hairy, yellow to brown moths. They have a short proboscis or none, short wings, and feathery antennae. Larvae are hairy with black heads and a white strip or row of diamond-shaped marks along the back. Also brownish and blue or red markings along the side. Egg masses are covered with a hard foamy material. Biology and life cycle: Adult moths do little or no feeding. Larvae live together in a silken tent. Cocoons are usually located in a protected place. Females lay eggs on twigs in summer, but eggs don't hatch until early spring. 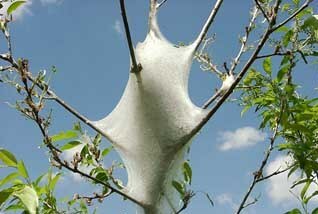 Larvae spin a silk tent in the protection of the nearest tree crotch. They feed for five to eight weeks, pupate in leaf litter, and emerge ten days later as moths. One generation a year. Habitat: Many deciduous trees and shrubs, especially apple, cherry, and plum. Field and vegetable crops during migrations. Feeding habits: Larvae feed on the foliage of trees and can completely defoliate the plants. Economic importance: Will defoliate and stress deciduous trees. Natural control: Birds; parasitic flies and wasps. Plant nectar and pollen plants to attract them. Organic control: Rip tents with a stick or prune branches with tents and destroy. 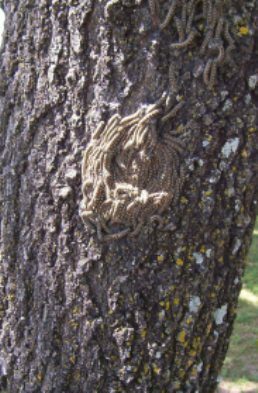 Spray caterpillars while young with Liquid Fire Ant Control sprays or catch them in sticky tree bands. Release trichogramma wasps in the spring. Spray plant oil products. Spray Bacillus thuringiensis product as a last resort. Insight: Do not kill caterpillars with white eggs or cocoons attached to their backs. These parasites will do the job for you. Texas has four species of tent caterpillars. 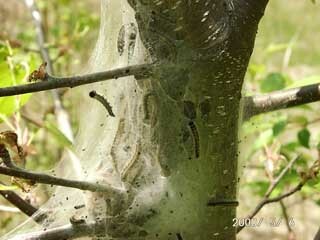 The eastern tent caterpillar and western tent caterpillar both build large tents in the crotches of trees. The Sonoran tent caterpillars builds small tents, and the forest tent caterpillar doesn't build tents at all. The eastern has a solid white line down the back; the western has white dashes down the back. The Sonoran has yellow and blue markings. The forest has a row of keyhole-shaped white marks. 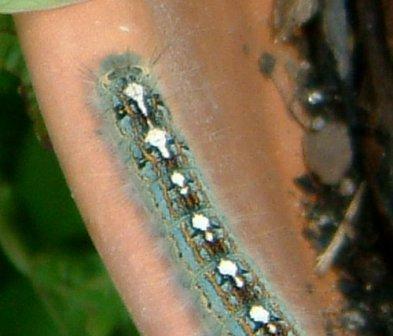 Pest caterpillars that attack trees in the late spring or early summer. They are generally more cosmetic than destructive. Release trichogramma wasps as the leaves start to emerge in the spring and as a last resort spray Bt (Bacillus thuringiensis) per label at dusk. Add 1 tablespoon molasses per gallon. They can also be killed with a spray mix of orange oil, compost tea and molasses.